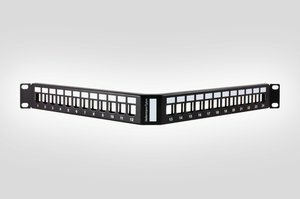 Product Description The HellermannTyton range of Modular Keystone panels offer exceptional flexibility and performance in an angled or flat format in 2U 48 port, 2U 72 port, 1U 48 port and 1U 24 port configurations. The Modular Keystone panels offer industry standard apertures and are compatible with the HellermannTyton range of keystone jacks. The use of individual keystone jacks offers a balanced system performance and also provides simple installation and maintenance allowing individual jack to be removed if required. The angled presentation increases rack capacity by allowing patchcords to be directed to the vertical cable management and aids correct cable bend radius. The Modular Keystone panel is supplied with Rack Snap mountings as standard. Optional rear cable manager is also available and is sold separately. Technical Description Manufactured from black powder coated mild steel. 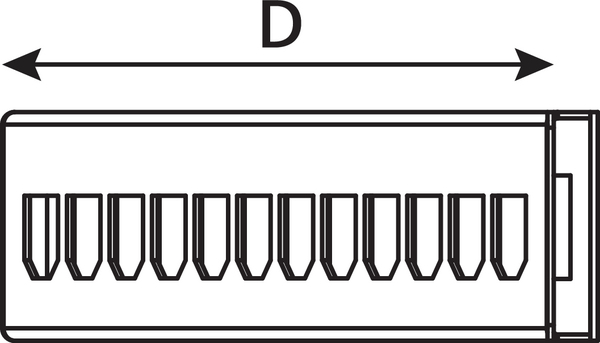 The angled presentation increases rack capacity by allowing patchcords to be directed to the vertical cable management and aids correct cable bend radius. The Modular panels are designed to accept HellermannTyton Connectivity's unshielded keystone jacks which are avilable in CAT6A, CAT6 & CAT5e. They are supplied as standard unloaded but include rack snaps for fast cabinet installationm. The rear cable management bar is sold seperately.